Scale Matters: What is Big? If you haven’t checked out yesterday’s blog post, it’d be best to start there! This week we’re having a series of posts discussing scale and size. I’m hoping you all have your imagination hats handy. I never leave home without mine. After discussing the tiny, microscopic aspects of our world yesterday it’s easy to see ourselves as these giants towering over these minuscule particles. In fact, when consider our role and impact on this planet, it’s hard not to feel big, brave, and onto of the world. We’ve explored the deepest trenches of the oceans, climbed to the top of the greatest mountains, and blasted to the moon and looked back at our planet. And then, once more, we realized once more how small we are. Cloudy skies lend to the view. Looked like a painting. My most recent ‘OMG – I’m tiny’ moment was the moment I walked up to the edge of the Grand Canyon and looked out at the natural wonder that stretched before me. I thought I had seen some pretty awe-inspiring, gigantic things in my life. Whales off of the South African coast. Giant Sequoias in California. But they all paled in comparison to the giant painted canvas that is the grandest of all canyons. It’s important to note that the Grand Canyon is not the largest, longest, or deepest canyon, but is still rightly so the grandest. We can move on to even more expressive depths. 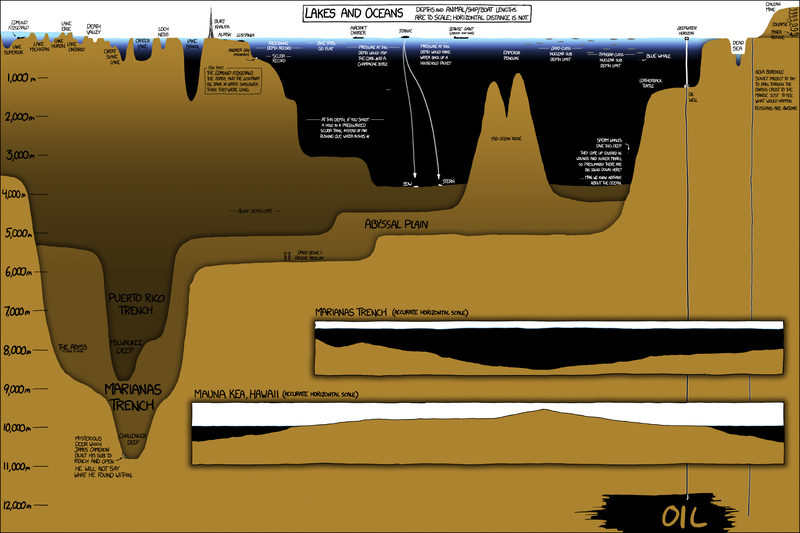 By stroke of luck, this week the man behind XKCD penned an impressive array of the depths of lakes and oceans. I was shocked to see that the Deepwater Horizon oil well went even deeper than James Cameron’s epic journey to the deepest trench in the ocean. Even a blue whale, the largest animal to have ever lived (that’s right, larger than all of the dinosaurs) is a mere blip on this scale. What I’ve found is that there is always something bigger that serves to make me feel like a dust speck on a pretty blue marble. Even as far as our own solar system goes, we’re on the petite side. Jupiter dwarfs us and is promptly dwarfed in return by the Sun. Our solar system to scale. Well, at least we can rest assured that the star in our solar system is quite a whopper, right? I mean, the Sun, she’s pretty big. Look at her! No? Really, are you sure? So there are suns that make our Sun appear to be a tiny dot. And THOSE ginormous suns are themselves dots among a giant expanse of galaxies. And those galaxies are specks in the great, vast, really, really, REALLY large expanse that is the universe. And to think, that at one point at the very beginning of time, all of this (all the planets, stars, galaxies, etc) began at one unimaginably dense, infinitesimal point from which everything expanded. It boggles the mind to try and comprehend these vast scales, but I suggest that you try. Go outside tonight and look at the stars, if you can, and think about the sizes and distances involved. Remember from the video in this post, Neil DeGrasse Tyson, talks about how when most people think about the size of the universe that it makes them feel small. But when he thinks about the universe he feels big, huge even, as he is (as we all are) made of and are part of everything. This website touches on some of the biggest objects in the universe. Can you try and guess what these structures are? Did you guess the biggest objects correctly? What were your guess and what surprised you about the answers? Are you enjoying this weeks series on scale? What is the biggest thing you’ve seen on our lovely planet? If you still haven’t had enough of this topic, then I highly recommend the following video. It’s 45 minutes long but it can help you visualize and provide additional information and astounding facts. Previous Previous post: Scale Matters: What is Small?